Bonnie is a must to learn about the rich and storied history of Savannah. She is very accommodating, knowledgable and pleasant. Bonnie's passion for her city is contagious and you will be more than pleased with you service. Bonnie was excellent. Five stars for sure. Articulate and wonderfully knowledgable. We felt we knew Savannah after the tour. She gave rest when needed but kept the day moving. Totally satisfied with the experience and Bonnie T.
Knowledgeable history scholar and engaging story teller. Tailored our tour to our expressed interests and some. Thank you Bonnie for a terrific tour! This was our first time to Savannah and needed to get overview of the city, culture, arts and history. Bonnie did a great job in two hours on our private tour to give us the baseline history of Savannah and the sites to see during our stay here. She also gave us some dinner recommendations along the way. My wife and I were very happy with the tour, Bonnie's knowledge and information on Savannah. My husband and I were most impressed by Bonnie's knowledge of Savanna's past and present. She was most accommodating to our mobility issues and ordered a Pedi-cab for our convenience. The driver was also thoroughly impressed with her knowledge, providing him with information he had not known. A most enjoyable experience. Bonnie hosted a terrific tour of her city even in the heat. She is energetic and has a vast knowledge of all that is Savannah.In the 3+ hours we had, she brought the city alive. If you want to really understand the history than she is a must. this was a great tour. We had limited time in Savannah while traveling past the city. Bonnie was wonderful and very knowledgeable. She met us exactly where planned and on time. She made the tour fit our interest and gave us information for us to use the balance of our stay and for future times for a longer visit. We highly recommend ToursByLocals. We loved our day long tour with Bonnie T. It was fun and educational and exactly what we ordered. We talked about it a lot afterwards and our teenagers loved it as much as we did! Bonnie’s dinner and breakfast recommendations were wonderful! Thank you! Bonnie knows her stuff and has a wonderful sense of humor to go with it. Bonnie was an extremely knowledgeable guide who provided us with interesting historical information. We thoroughly enjoyed our 2 hour walking tour and recommend her services to others without question. Bonnie knows her city. She gave us great detail about the many historical sites and interesting people of Savannah. Additionally, she gave us suggestions for places to visit after the tour. All delivered with a delightful sense of humor. we enjoyed her tour very much and will book with her when we return. We highly recommend her. Bonnie is an expert in Savannah history. Her knowledge and anecdotes of the people from the past made her tour so enjoyable, relaxing, and just what our group of 14 really wanted. We highly recommend her! We had a great time with Bonnie. She was really knowledgeable. Absolutely loved it! Bonnie was absolutely terrific. I was in Savannah with 4 of my best girlfriends for a girls weekend. We toured with Bonnie on our first morning and spent 3 hours with her getting a wonderful sense of Savannah's geography and history. We were particularly impressed with her abiility to speak of Savannah's slave trade in a thoughtful sensitive manner. Would highly recommend her. Bonnie was FANTASTIC!!! So incredibly knowledgeable and fun and funny! SO SO SO glad we booked the tour with her! It was worth every single dime! I will certainly use her again and recommend her to others. BONNIE IS THE BEST!!! Bonnie was an incredible guide. She was so knowledgeable about Savannah and gave us so much history of the area. She was enthusiastic and so helpful in accommodating our needs. Would recommend her to anyone wanting an in depth tour of Savannah full of local history and flavor. Bonnie was a wealth of information and great sense of humor, born and bread Savannah girl which always adds to any tour if the guide is truly local. Terrific recommendations on restaurants, shopping and sites to hit elsewhere. Highly recommend Bonnie to anyone. A blast indeed. A tour with Bonnie provides an amazing amount of information that surpassed our historical knowledge. Using the 22 squares as the backdrop we learned so much about the city and the early leaders. The two hours past so quickly we didn't want it to end. Bonnie is an great person with a wealth of knowledge and insight about Savannah. Really enjoyed out time with her. Bonnie's tour could not have been better. Content, pace, knowledge was all top notch and she also is a very nice person to boot. She made the whole thing feel like taking a stroll with an old friend. Highly recommend her. Bonnie was fabulous. Born and raised here she also is a historian. She was able to give a detailed history of the impact the American Revolution and the Civil War had on Savanna. 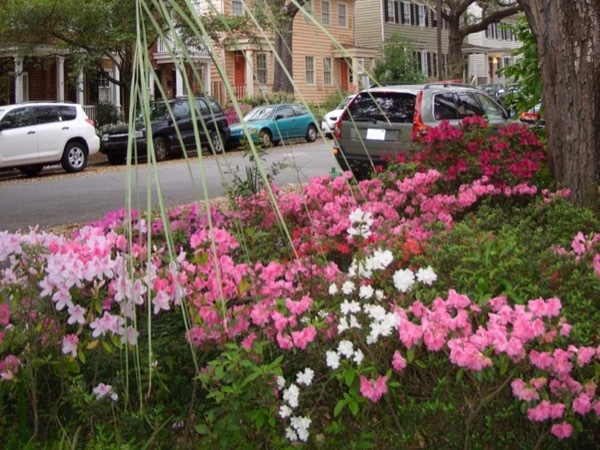 Buckle up for a fast paced and informative walk through the city of Savannah. Bonnie is a wealth of information and opinions about the history and events that made Savannah the city it is today. She is quite flexible in what we choose to cover and very helpful in what can/should be done next after the tour is complete. Perfect! Had limited time in Savannah and wanted a good thorough tour and Bonnie delivered. Thank you, Bonnie! Enjoyed the "mosey" walk and Bonnie's extensive knowledge of everything along the way. Thank you for the great recommendations for eating and getting around the city. We really enjoy the advantages of a private tour set to our pace. Bonnie was wonderful! She arrived on time, and gave us more time than allotted. Bonnie truly knew her history of Savannah and presented very well with humor and candor. She is a local, born and raised and proud of her City. My husband and I really enjoyed spending the day with her. She was flexible and delightful! We were utterly amazed at all of the events that took place in this 13th colony. The people in Savannah were so cordial and friendly. We can't wait to go back. Wow! She sure knows the history of Savannah! Bonnie has a great personality. She geared the tour to our interests. She shared her love of her city. We had a great day with her. Bonnie was fun and knowledgeable and adjusted to our pace. We took her recommendations and visited some locations in more detail the next day. Bonnie excellent guide. I love history & she made Savanah come alive by uniting past & present. Three generations of my family was able to really enjoy our walking tour of Savannah. We all agreed how informative, engaging, and funny Bonnie was during our tour...thanks, Bonnie! Our group of 17 was disparate in terms of interest in history and architecture. Bonnie did an excellent job of keeping the group very interested over 2.5 hours. I would highly recommend her. The best ever. Bonnie was fantastic in every way. It was very enjoyable to understand what you were looking at and the history behind it. Well worth the cost. Highly recommended. Bonnie was an excellent tour guide and easy to talk to. She was smart and funny and had a sense of humor that really played well with ours. She gave us plenty of breaks along the way to sit (we'd already been walking for hours before our tour began) and she was very well prepared when we stopped at the different establishments for our snacks and refreshments. I'd definitely recommend Miss Bonnie to anyone looking for a historical tour! What a fantastic and educational tour. Bonnie brought knowledge and humour together in a way that made the tour fly by. My kids enjoyed it and more importantly remembered much of it when it was over. I would do another tour with Bonnie without hesitation. We loved our tour with Bonnie. She met us as our VRBO and we walked through Savannah together. She gave us a great history tour of the houses, squares and important figures in the history of Savannah. We could have spent the entire day learning about the history of savannah with her. We recommend her highly! We really enjoyed out tour with Bonnie. Not only was she extremely knowledgeable but relayed the information in an interesting and engaging manner. Bonnie covered all the historical information we were interested in. We really got a sense of what life in Savannah was like from its beginning to present day. I would definitely recommend Bonnie to anyone interested in a wonderful guided walking tour of Savannah. We requested a focus on history and Bonnie exceeded our expectations. Fantastic tour and tour guide!! Bonnie is very knowledgeable about Savannah, and she does a great job of bringing the city's history and culture to life. She is exceptionally personable, and great to get along with! It felt like an old friend was leading us through the city, rather than a tour guide. Highly recommended!!! Extremely knowledgeable about local historical data and its fit into a global perspective. Enjoyed the tour very much. Bonnie was an excellent guide for our first visit to Savannah! She is very knowledgable about the history and layout of the city and provided some very useful information for our stay! Thanks, Bonnie! TOUR GUIDE RESPONSE: I am always dismayed when I miss the mark regarding a customer's expectations. Ms. Cleghorn's tour was a special and very unorthodox arrangement that was a new experience for me and I did my best to put together what she asked for. Bonnie was GREAT!! My sister and I enjoyed very much her knowledge and especially how she made history come alive with her storytelling. It was a memorable tour. Bonnie was great. She was kind enough to meet us at our hotel. She tailored our tour, moved at our pace, and answered all our questions. She made great food recommendations too, which we really appreciated. We would definitely recommend her and would certainly use her on our next visit to Savannah. We loved Bonnie and the job she did giving us information about Savannah we never knew. Great information with a little attitude. Will definitely recommend to others! Bonnie was absolutely fabulous! Not only was she extremely knowledgeable and educational, but she made our 4 hour walking tour fun and fresh. Our 16 and 9 year old daughters did not complain once! (A miracle, I assure you). She was accommodating of our few requests and covered everything we wanted to see and more. If you're ever in need of a guide in Savannah, Bonnie is it! She was fantastic !!! Very informative and fun !!! Gave her a fat tip!! !